1. The House Has Eyes! 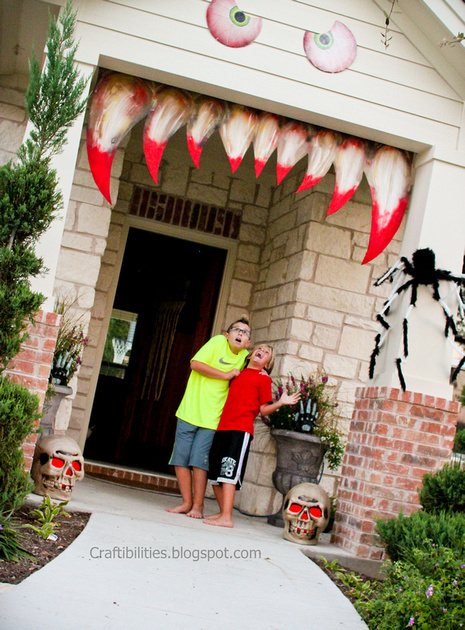 Teeth and eyes are spooky cut-outs to put over your front door. Cut out black contact paper in the shape of a murderer to create terrifying shadows at night! Oversized spiders create an especially chilling effect crawling down taller houses. Add spiderweb spray to really put the look over the edge! 4. Skeletons Are Breaking In! 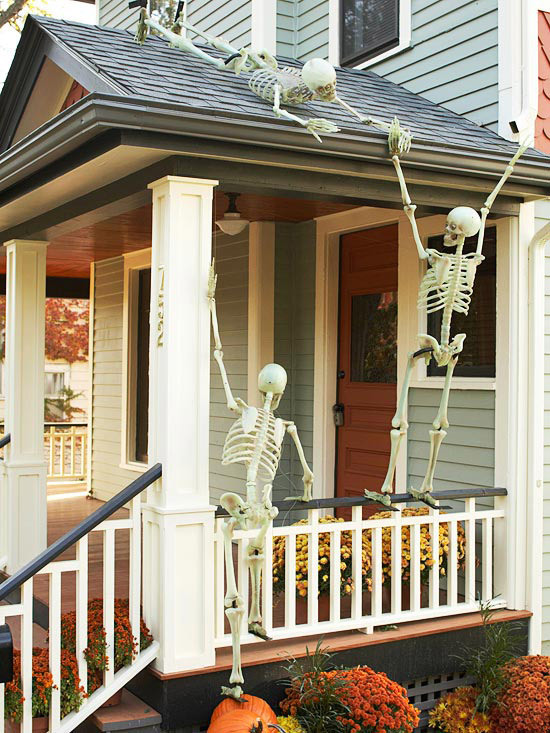 A fun twist to the classic skeleton decor is arranging them to look like they’re breaking in! 5. It’s Not a House, It’s A Mouth!! 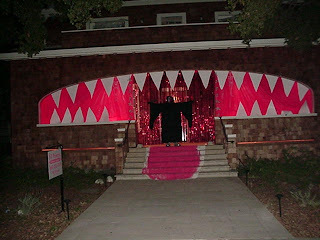 Teeth, pink porch lights, and a chalk tongue to transform your home into the jaws of death! Your house turns into a ship with the help of painted poster tubes. Home offices are essential to any home. Even if you don’t have anyone who is specifically working from home. Creating a place in your home that is conducive to reading, writing, getting homework done, creating music, or indulging in crafts will help keep your home efficient. Whether or not you have an extra room for an office, don’t worry! These tips will work in any space! Bookcases – These are a great jumping off point, especially if you’re not working with an extra room. While bookcases are great for the obvious – books! – they can double as storage. Filing boxes can help disguise craft materials, old bills, gift wrapping essentials, extra office supplies, etc. Bookcases are relatively inexpensive, and if you’re willing to go the extra mile, you can disguise a free standing bookcase as a built in one, with these easy steps. Desks – Once you have your bookcase ready to go, the second step is placing your desk (or desks). Don’t feel restricted to the classic, single desk against the wall. Although those do look great, you have more options depending on your home’s needs. Tables – these are great for the artistic worker. If you work spread out/with multiple people/mainly with crafts, this is the desk for you. Place it in your space with area around all four sides – similar to how you would place a dining table. For best placement try it perpendicular to your bookcase, or centered under a light fixture. Double Desks – family offices can be hard to organize. We love the look of classic desks side by side, along a wall, and separated by a bookcase or smaller table. Alcove Desks – Unused closets can easily be transformed into a built in office. Lighting – Efficiency has a lot to do with setting yourself up for success. If busy work is piling up, you need an inviting well-lit area. Direct the light in your office with a desk/floor lamp , or make a statement with a pendant light. If you need help creating an office in your home, give Handyman Matters a call! 866-FIX-MY-HOME. In honor of World Food Day, Handyman Matters brings you are favorite kitchen remodel trends! Farmhouse Sinks – Add a little extra room to you kitchen clean-up with a farmhouse sink. Perfect for the house chef and larger families. Coffee Bar – Set up an area of your kitchen for coffee, and coffee accessories only! An indulgence for the overly caffeinated, that will definitely speed up any morning routine. Chimney-Style Range Hoods – Stoves are often the focal piece of a kitchen. Chimney style range hoods work as a playful, industrial accent that also helps ventilate you smokier concoctions. Butcher-Block Counter Tops – Wood is one of the biggest home improvement trends this season. Butcher-block counter tops are an affordable alternative that adds a warm, familiar feel to any kitchen. White Cabinetry – It is easy to update outdated cabinets with a fresh coat of white paint! It will help make your kitchen more modern, and if you have a white ceiling, it’ll make it seem higher. Handyman Matters specializes at kitchen installations and remodels. To find a handyman near you dial 866-FIX-MY-HOME.